Today we have the pleasure of sharing Judy Green’s story and how she came into possession of an original letter written by Laura Ingalls Wilder. 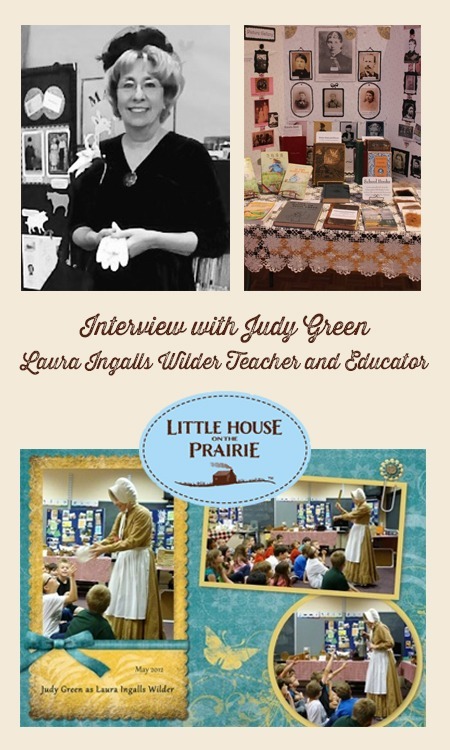 For 26 years Judy has been bringing the stories of Laura Ingalls Wilder to life in schools, libraries, historical societies, mother/daughter banquets, and Girl Scout troops. She dresses up in pioneer costume and carries dozens of artifacts with her directly related to the books, and pioneer life. Her treasure is a letter written by Laura in 1949, given to her by a generous fan who wanted children to be able to see it. She’s had lots of fun sharing this letter with others for the past 15 years. You can read Judy’s interview here and be sure to share your stories with us as well! My story is similar to many. In the late 1950s, my fourth grade teacher picked up Little House in the Big Woods and began to read aloud. I was immediately captivated. I remember being very annoyed another day when our teacher refused to read as a punishment to the entire class. I exited the school bus that day whining, asking my mother to, “PLEASE get me this book!” because the teacher wasn’t reading it fast enough. I devoured the entire series and was left with a sense of loss when I finished These Happy Golden Years, wanting more, and wondering about the real people standing behind the book characters. This was in the early 1960s, so I did not know of any way to find out more. In the 1970s I discovered the book Laura, by Donald Zochert, and learned the existence of the historic locations, and made visiting all of them my eventual goal. In that I have succeeded. I also can credit William Anderson with supplying much of my knowledge of Laura’s back story. 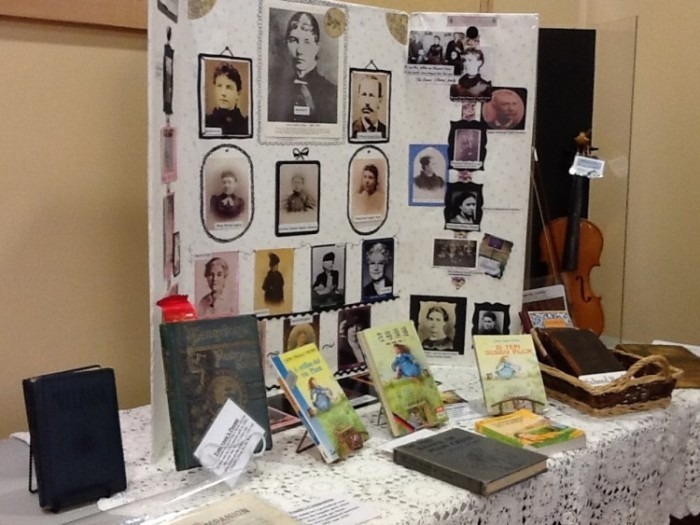 Laura Ingalls Wilder photo board and book series. In the meantime, while I was working in the children’s department of a public library, the supervisor asked all of us to create a program that could be utilized by the local schools. It was called Have Story Will Travel. My contribution was “Laura Ingalls Wilder; the story behind the stories”. Q: What types of artifacts do you bring to the classroom, and how do children react? 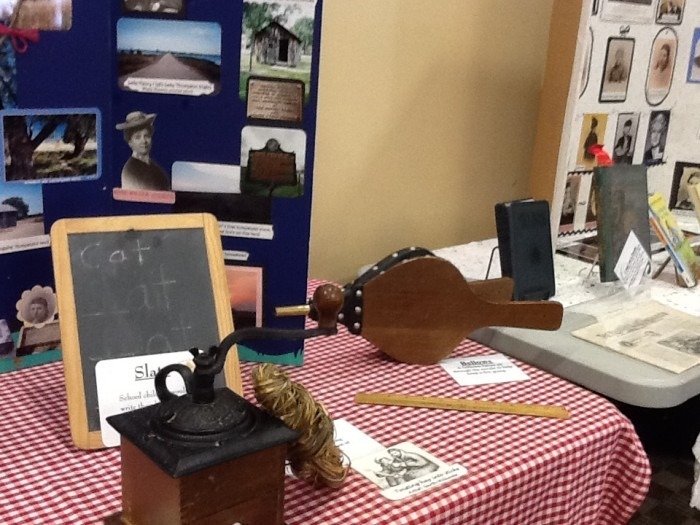 I dress in pioneer costume (calico, bonnet, apron), and can easily fill five long tables with my artifacts and photo boards. I have replicas, only of things mentioned in the stories. Coffee grinder and chalkboard slate replica. I have an exact replica of the glass bread plate mentioned in The First Four Years, plus examples of Blue Willow, pink flowered Haviland Limoges, and Rosebud Chintz to which Laura was partial. 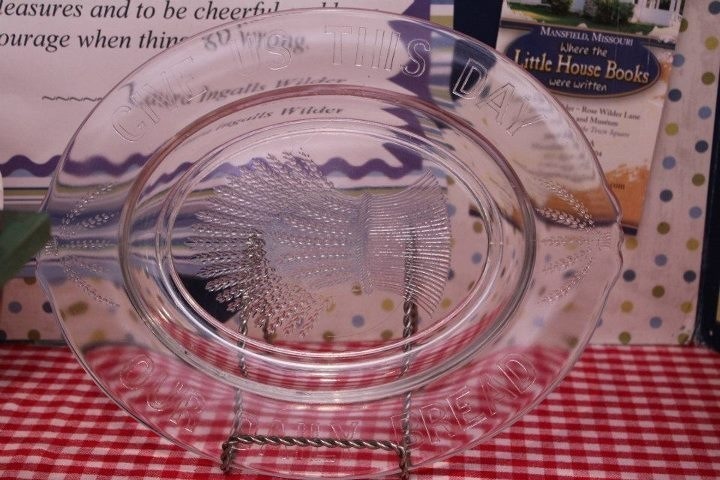 Also examples of Crown Silverware, by Rogers and Bros.
Laura Ingalls Wilder’s glass bread plate. 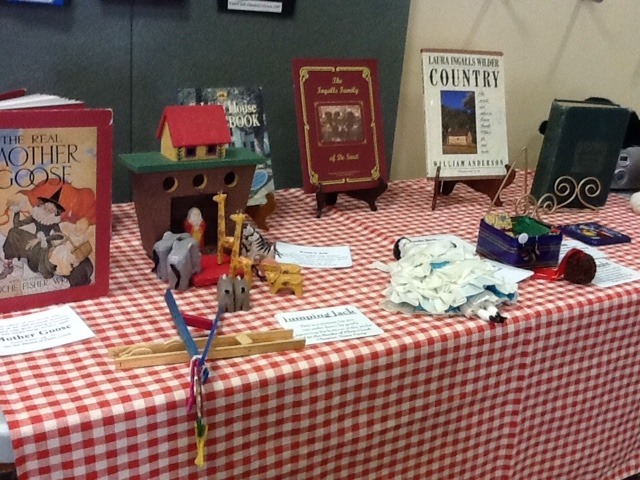 Little House on the Prairie replica and book display. 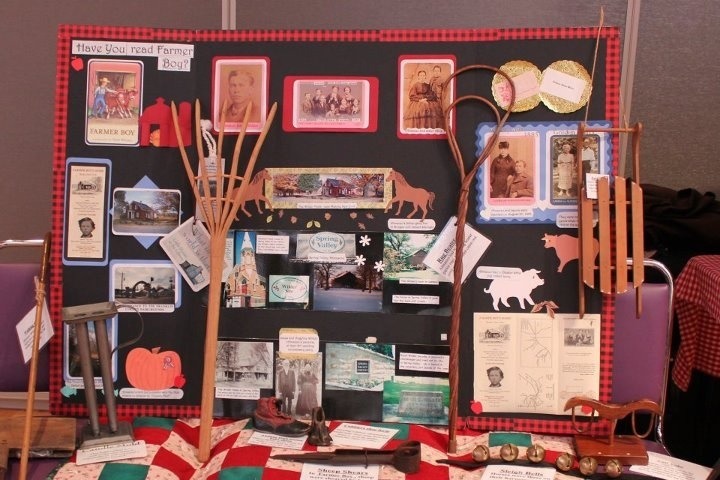 The Farmer Boy educational display board with replicas. The artifact that causes the most excitement is the pig’s bladder. I tell the story using a fleshy colored helium balloon, but then pull out a real pig’s bladder to illustrate how different toys were 150 years ago. Most children do not recognize the bulk of my artifacts, so it is a window into the past for them. They love looking closely and being allowed to touch the artifacts. I have noticed boys and girls alike are captivated by the stories. They write the most amusing thank you notes and include their own drawings. It really makes me feel like I have touched their lives by sharing my love of these stories. Q: Please tell us more about the letter in your possession. I do carry a very special item that has great meaning for me. It’s a letter written by Laura in 1949. In the year 2000, I was performing my program in a Canton, Ohio Library. There was a woman in the back of the room who simply approached me and told me she owned a letter written by the REAL Laura, and asked if I would like to have it? Her name was Karen Harding and many years earlier, her mother, Mrs. 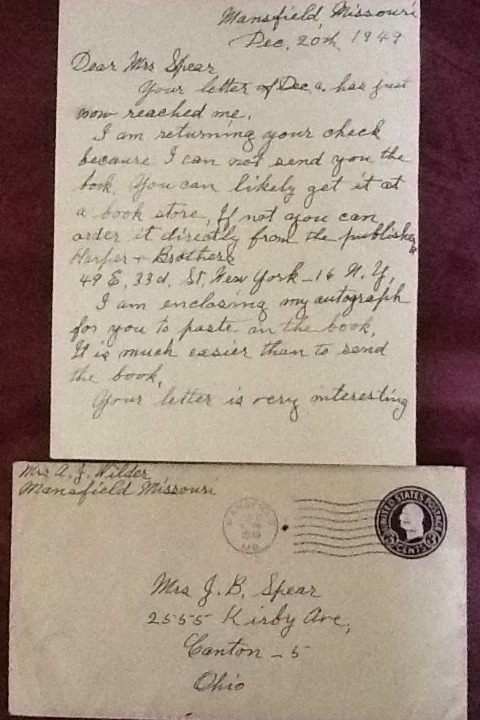 Spear, had written to Laura in her Mansfield home and enclosed a check, making a request to Laura that she might buy one of her books and autograph it, so she could give it to her daughter. Laura wrote back, explaining she would not do that, but here was a piece of paper with her autograph on it, so Karen could paste it in her book. 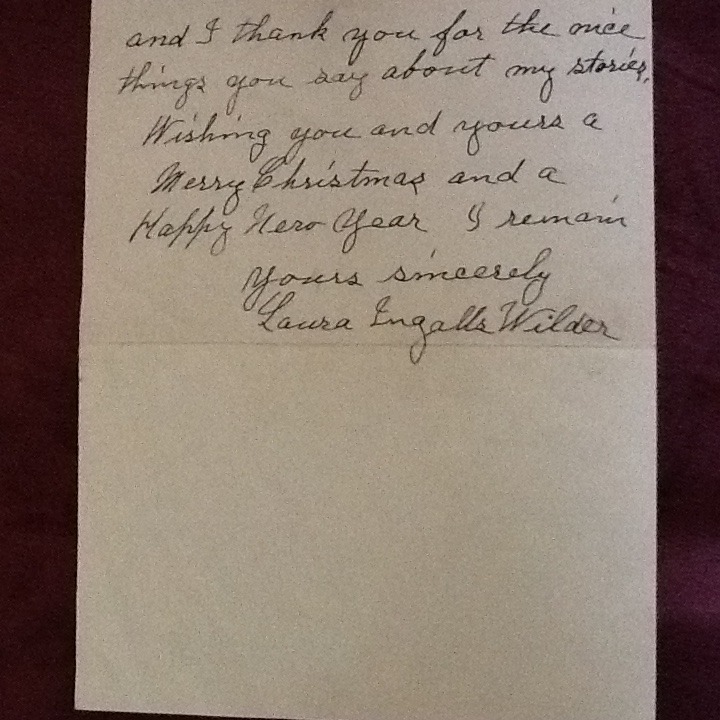 Authentic letter written by Laura Ingalls Wilder. When I met Karen, she was moving and downsizing, and wanted Laura’s letter to be in the hands of someone who would share it, rather than have it sitting in a drawer. Thousands of children have seen it since. I took it to Antiques Roadshow years back, and they valued it at about $400 since it had the original envelope as well. It is priceless to me, and I hope to leave it to some deserving programmer when I die. My family has instructions to make sure it goes to someone who will continue to share it. Do you have a story to share about what Laura and her stories have meant to you? Share them with us here and be sure to subscribe to our newsletter for future exclusive interviews! Like you, I grew up loving the Little House books. Some of my most enjoyable memories of school included afternoons spent listening to my teacher reading aloud from her collection of Little House books. I remember that I would check the books out of our school library almost every week. One Christmas I asked my parents for copies of all the Little House books. On Christmas morning when I opened the package I could not believe my eyes – there was a boxed set of the Little House books! I thought I was in heaven. When I become a teacher in 1981, I knew I was going to continue the tradition of reading my beloved Little House books to my students. That first summer that we were out of school on break, I had the opportunity to travel to some of the places that Laura and her family lived during their many travels. Gosh – it was like a dream come true for me. I had a great time! After that trip, I found my collection of Little House and Laura items growing and growing. I loved sharing my collectables with many, many children through the years. I would love to do what you have done with your collection. You have brought Laura and her family alive for many of her readers. Maybe I will work on making that dream come true one day as well! 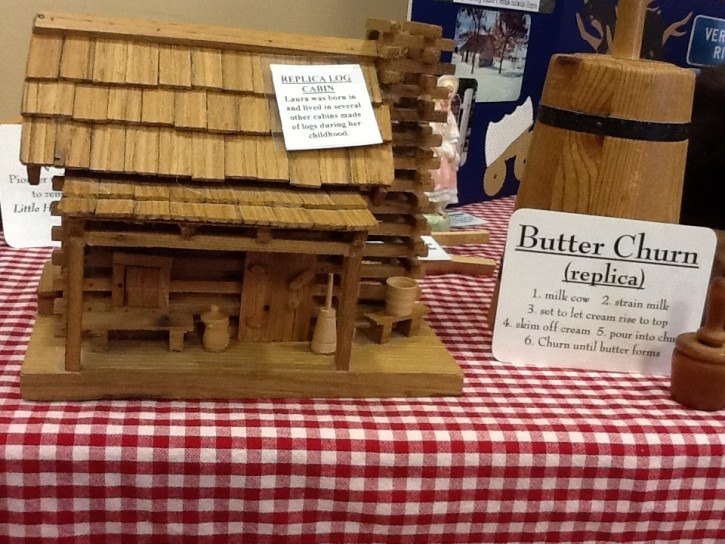 Thank you for sharing your amazing displays. I wish there were more pictures! I am also a fan of Laura Ingalls Wilder and last year was able to visit Rocky Ridge Farm. It is so nice to see that her life and stories live on with people like you! I love the idea of your displays and presentations and will have to see if it could be incorporated into our school system. Thank you again for the example!